Vocals. 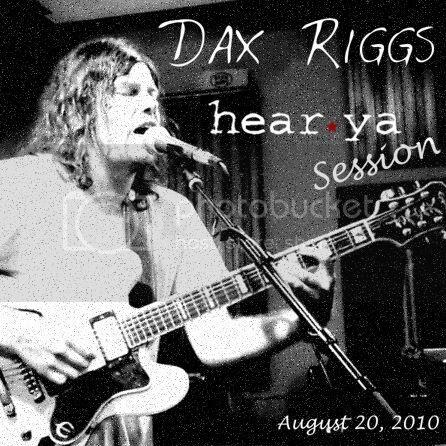 That’s what immediately comes to mind when I hear the name Dax Riggs. His voice is other-worldly, expelling dark lyrics in a visceral howl. He’s half man, half beast. Riggs’ musical career broke with his band, Acid Bath, garnering him a following in the underground metal scene. We fell in love with him after he formed Deadboy and Elephantman in 2002, which featured a more blues-inspired sound, landing squarely in the HearYa sweet spot. Here we are in 2010, embarking on Halloween, and Dax Riggs has just released his third solo album Say Goodnight To the World. It’s a gloomy album that was recorded in his home studio in Austin, TX. I can’t think of a better session to ward off (or maybe welcome) evil spirits in the month of October. Stop, I’m Already Dead is still one of my favorite tunes from recent years. He’s got some unique titles for tunes but the dude can flat out belt it out. I also like that we did this session in black and white. Fits the mood real nice. I gave Dax my soul because he shared his with me! I thought this needed to be said…. bc it’s 4:58 in the A.M. Good Morning too all you WE folks! Best session i’ve seen come from Hear Ya so far. Real band, real singer, real musicians, real live amazing set. Bravo. i love stop, im are already dead, the the hangmans daughter, then deadgirl, the as gone as gone can be. This has to be one of the best videos of the band ive seen. Almost as good as seeing them live. LOVE DAX! “I could disapear live only in your tears” Great Sound, Great lyrics! just listened again. ummm omg awesome!!!!!!!!! Love this! I’ve been listening to Dax a ton lately, and then I run across this. I saw him the night before this in Grand Rapids and he was lights-out. We’re working on it…thanks for the heads up. Hope to have the session links back in order this weekend. Chrake…not sure why there isn’t a “download zip folder” option anymore. In the meantime, simply right-click and “Save As” each file you want to download. Thanks for checking out the session. When are you coming back to Tampa Florida/St.Pete?